You guys know I love watching football. However, I’m not such a fan that I’ll watch just any game with teams that I don’t care much about. So unfortunately for me, this has been a very boring season. All the teams I root for didn’t make the playoffs. And even the teams I root against didn’t make the playoffs, so I really had very little excitement this year. But I still love having friends over on Sundays and I always have fun making tasty nibbles for everyone to enjoy during the games. All is not lost. Since the Super Bowl is coming up, I know many of you will be hosting friends and family at your house or will be invited somewhere. Now is the perfect time to figure out a few fun, easy and delicious game-day recipes. We always have a few people over for the Super Bowl – nothing big because otherwise my husband can’t “concentrate” (on the game, not in general.) I usually keep a big pot of chili (see these recipes for vegetable chili, Southwestern turkey and black bean chili, and veggie-sweet potato chili) on the stove with a topping bar on the kitchen island and some cornbread. I also will have either a taco bar or a baked potato bar as well. It’s all easy, can be prepped in advance and I think most people like to customize their own meal. 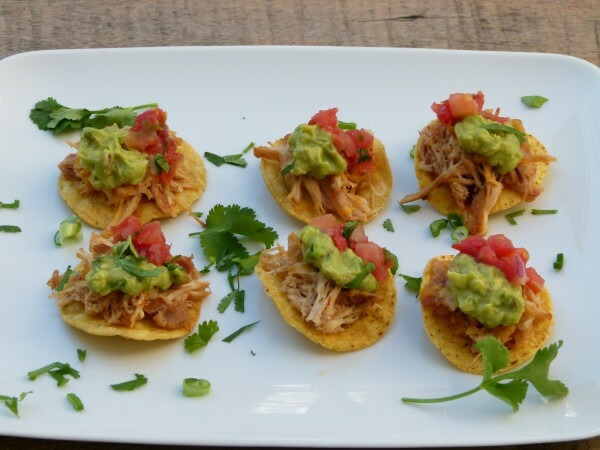 You must try these mini chicken tostadas! My kids go crazy for them. 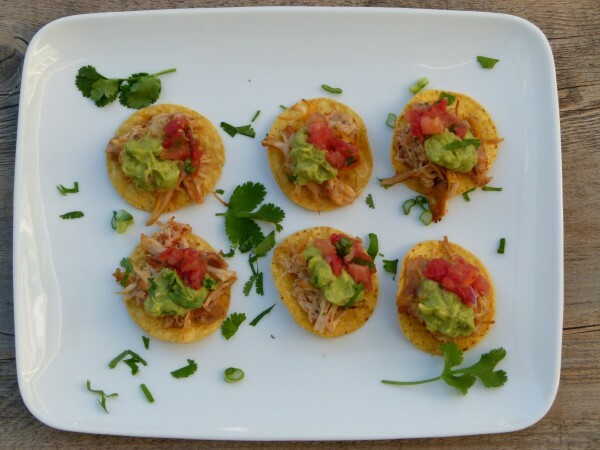 A tostada is a fried, whole tortilla topped with variety of goodies – shredded chicken or beef, refried beans, lettuce, salsa, sour cream, guacamole, really whatever you would put on a taco. 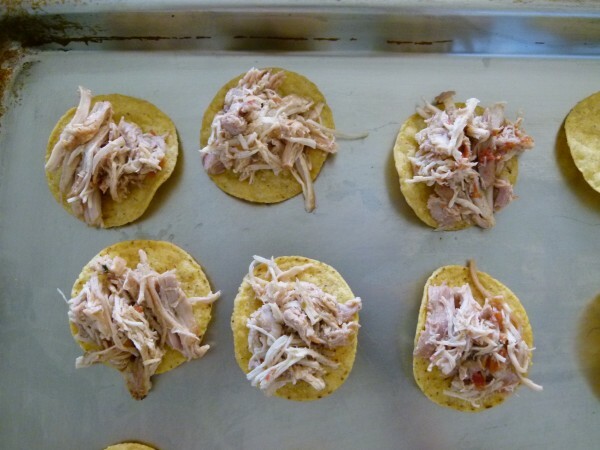 I find tostadas a bit awkward to eat, but these mini ones are much less messy and they are still customizable. I like to bake my own tortillas to make chips, but only when I have time. I’ll give you directions for how to make your own baked mini tortilla rounds for this recipe, but if you’re having a crowd, I would probably just go get the round, organic tortilla chips from Trader Joe’s or elsewhere. Maybe less healthful than baking your own, but much easier if you have a lot of other things to do. 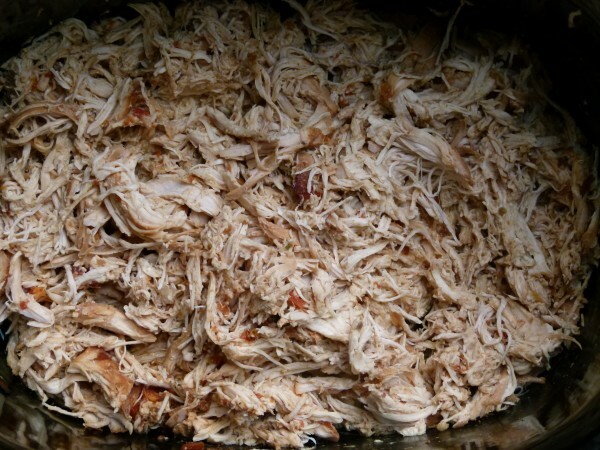 Make some chicken taco meat the day before either in the oven or the slow cooker and you’ve got a very easy crowd-pleaser! 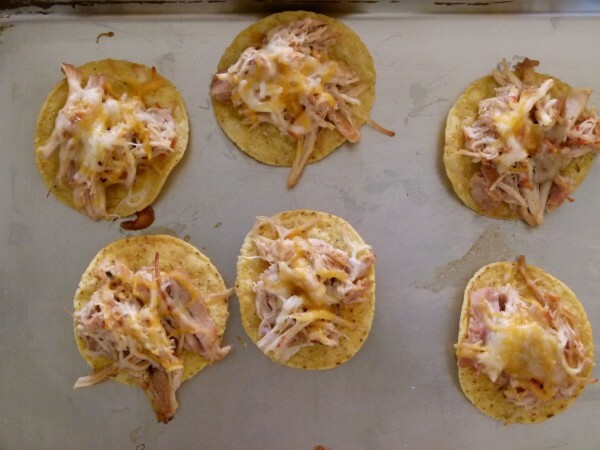 The way I like to make these is to put a pinch of chicken and cheese on each tortilla round and bake them for a few minutes or until the cheese melts a little and the chicken is warmed through. But, if you make your chicken the same day and it’s still warm when you put it on the chip, it’s up to you if you still want to pop them in the oven. Then just top them however you like. I also make these vegetarian with refried beans instead of chicken. Either way, they’ll be a winner! Brush both sides of each tortilla with a little olive oil. 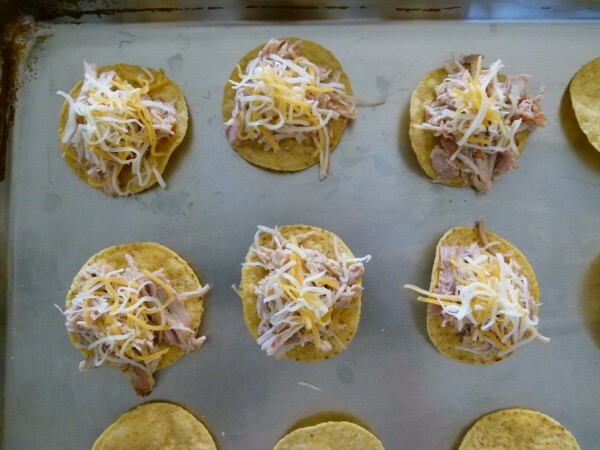 With a 2 ½-inch cookie cutter, try to cut 3 rounds from each tortilla. You can bake the scraps to make crispy bits to top a salad or soup. Bake 15 minutes or until golden brown. They will crisp up as they cool. These can be made the day before and kept in a covered container at room temperature. 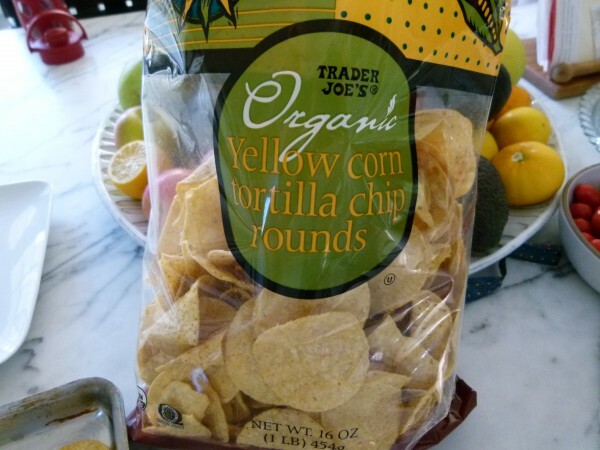 Or, instead of making baked rounds, buy round tortilla chips. When ready to serve, preheat oven once again to 375 degrees. Put a pinch of chicken and a pinch of cheese on each. Bake until chicken is warmed through. Top with desired accompaniments. I think you can assemble there. Warm up the chicken at your house and then maybe you can get away with not warming everything through in the oven. Everyone will love them! Yum! Do you happen to have a favorite way to make refined beans for the vegetarian version, Pamela? These look delicious. Thank you!